“It’s all Greek to me”! This is what most people say when they try to read the Greek alphabet for the first time. However, many letters are similar to the Latin letters. Moreover, if you remember your Maths classes, you may be familiar with some of the Greek letters, like pi (π) or tau (τ). 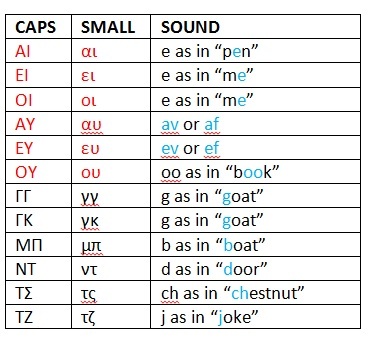 Read on to find out more about the Greek alphabet and the way words are pronounced! The Greek alphabet has 24 letters, of which 17 are consonants and 7 are vowels (marked in red below). Apart from the 24 letters, we also have a few letter combinations. The vowel combinations above are marked in red, and the consonant combinations are marked in black. As the Greek alphabet doesn’t have letters for the sounds “b”, “d”, “g”, “j” and “ch”, we use the combinations above. 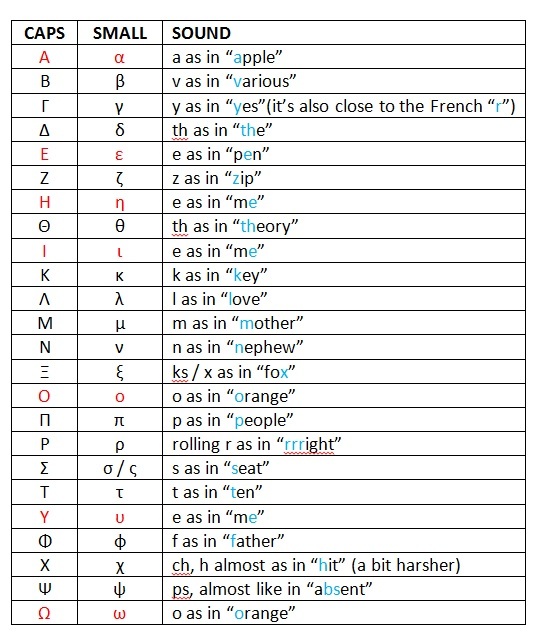 Once you’ve learnt how to read and pronounce each individual letter in the Greek alphabet, you can read and pronounce ANY Greek word! In terms of pronunciation, Greek is very straightfoward. In English, the same letter can be pronounced in many different ways. Think of the letter “a” in “apple”, “ball” and “flakes” – it sounds very different! On the contrary, all Greek letters sound the same every time we read them, with the exceptions of letters Γ and Χ. If you have read this far, you may have noticed that a few letters are pronounced in exactly the same way. 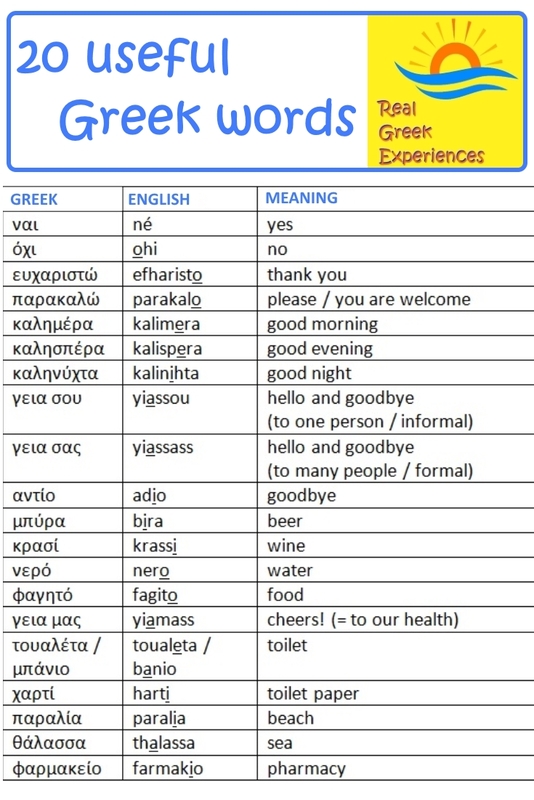 This will make your life easier when speaking, but it might confuse you at first if you decide to study Greek. There are two letters (Ω and Ο) that sound like “o” in “orange”. The above is pretty much all you need to know if you want to read Greek. On the other hand, speaking our language properly isn’t that straightforward. However, if you are here for a visit, you are unlikely to need more than a few words. If you are planning a trip to Greece, you may want to learn a few Greek words before you travel. Although English is widely spoken, an effort to speak Greek will attract some smiles, and possibly some treats! 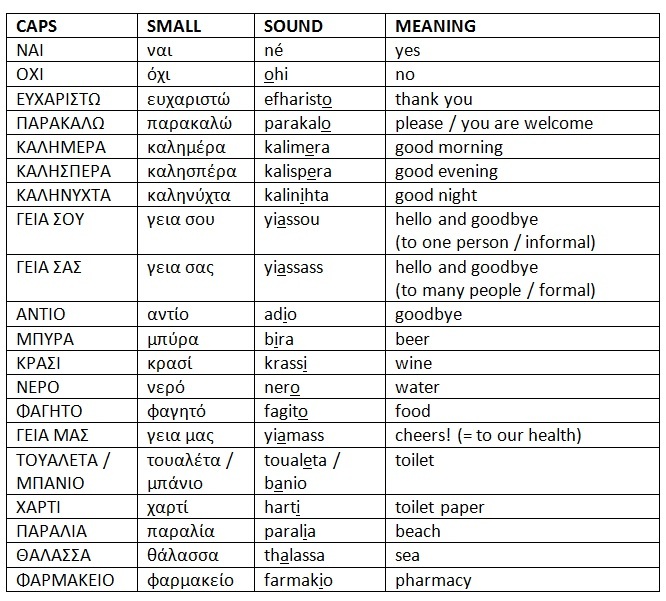 Here are 20 words that you are likely to find useful during your holiday in Greece. If you were disappointed not to find the word “malakas” in this table, we are sorry. You can use Google though! Did you find this introduction to Greek useful? Are there any other Greek words you’d like to know? Please leave a question or a comment below!